Soorma (transl. Warrior; Hindi pronunciation is a 2018 Indian Hindi biographical sports drama film based on the life of hockey player Sandeep Singh, directed by Shaad Ali and produced by Sony Pictures Networks India and C.S. Films. The film stars Diljit Dosanjh and Tapsee Pannu in lead roles and it was theatrical released on 13 July 2018 to mixed reviews from critics. The official trailer of the film was released on 11 June 2018. 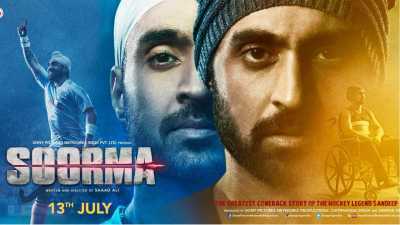 Soorma tells the story of the international hockey player Sandeep Singh, played by Diljit Dosanjh, who was paralyzed and used a wheelchair for two years after an accidental gunshot injured him in 2006. The film’s tagline is “The Greatest Comeback Story of the Hockey Legend Sandeep Singh”. Fighting against all odds, Sandeep got back on his feet and made a comeback to international hockey in 2008. India won the 2009 Sultan Azlan Shah Cup under his captaincy and went on to qualify for the 2012 Olympics.